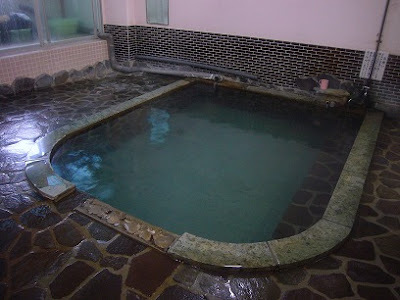 There are three wonderful public baths at Kawarayu Onsen. Highly recommended for soak addict. The Syotensama Rotenburo. Looks like a small hut on a hill. Located up on a hill, this male and female mixed open-air bath has no changing room. 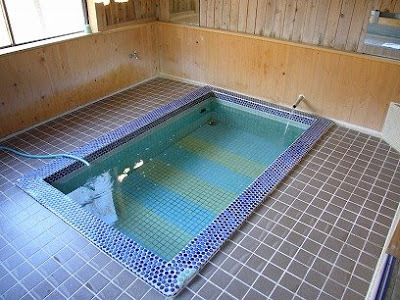 There are roof, wood deck, shelves, a clock, fee box, and some bowls besides the bath itself. That's all. Soaking towels into the bath and wearing swim suites are prohibited. No walls, low fences. Too open? It's embarrassing for most ladies to soak themselves in. As for me, I visited in the early morning in March, fortunately I didn't meet any other visitors. Admission fee is JPY 100. Opens 7:00 AM to 7:00 PM, until 8:00 PM between Apr. and Nov. Smoking, eating and drinking are strictly prohibited in and around the bath, also at the other public baths. 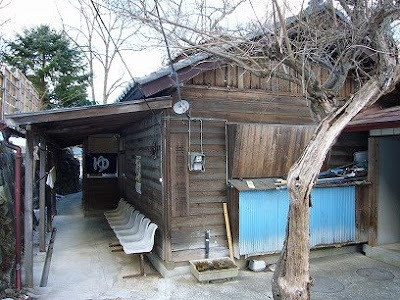 Near the Syotensama Rotenburo, this small simple and neat (at least inside) public bath has ladies' and men's space separated. Mainly for local residents, but open to visitors as well. Admission fee JPY 300. Opens 10:00 AM to 5:00 PM, until 6:00 PM between Apr. and Nov. 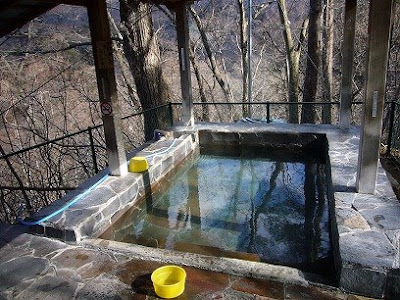 The character "ゆ" means hot water. This is the biggest of the three, and there is a manager at the entrance to collect admission fee. 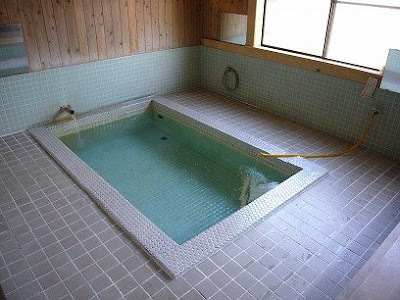 It has Uchiyu indoor bath, and Rotenburo open-air bath (unfortunately this Rotenburo isn't so open). Both have men and ladies separated baths. Usually at other places, the Uchiyu and the Rotenburo are connecting, but they are separated here. Each has their own dressing room, and you have to put on cloths before moving to the other. Admission fee JPY 300. Opens 10:00 AM to 5:00 PM, until 6:00 PM between Apr. and Nov. Closes on New year's day and 20th. Jan. The most touristic place among the three. 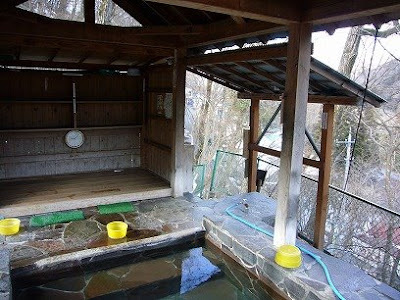 The Rotenburo, open-air bath is small, and not so open as the Syotensama Rotenburo. 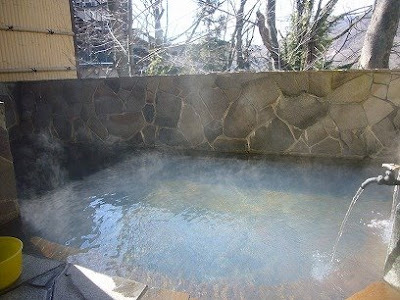 The Kawarayu Onsen is in Gunma Pref, Kanto area. It's within a day trip distance from Tokyo if you want. 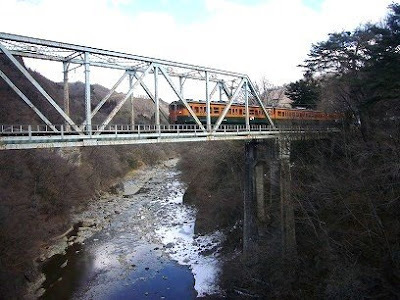 The express train "Kusatsu" from Ueno will directly take you to the Kawarayu station in two and half hours. 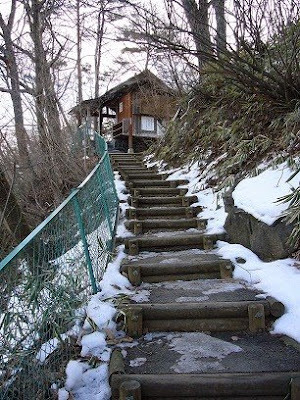 You can drop in on the way to/from the Kusatsu Onsen. It's an easy walk from the station to all of the public baths I mentioned above. If you choose local trains, first go to Takasaki（高崎） with Takasaki-line, then change trains to Agatsuma-line（吾妻線）. The Agatsuma-line trains serve every hour or less. An Agatsuma line local train near Kawarayu station. 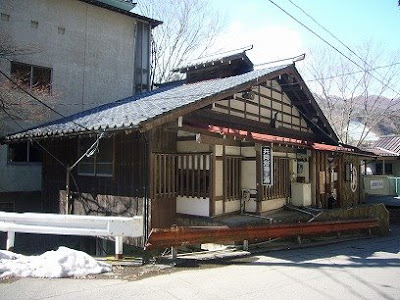 There is a tourist information center in front of the Kawarayu Onsen railway station. (I doubt they speak English.) They serve Japanese noodles and buns. There is only a few places to eat in the area. The 40 year-run Furusato restaurant near the entrance gate is closing down at the end of Jan. 2009.